Are you on your feet a lot, selecting goods from shelves in a warehouse? Do hard concrete floors take their toll on your feet? Take a look at our choice of the best shoes for warehouse pickers. Your toes and feet need protection in case something drops on them, but that should not be at the expense of comfort. Here’s what we think are some of the good shoes for warehouse work. If you like an athletic style shoe, these could fit the bill. They have all the extras you might need, including alloy safety toes and protection from electrical hazards. A mesh lining lets your feet breathe, while anti-fatigue technology keeps you comfortable. This casual-looking shoe has lots of protection built in. There is a steel toe cap, a shank for stability, and anti-slip soles. 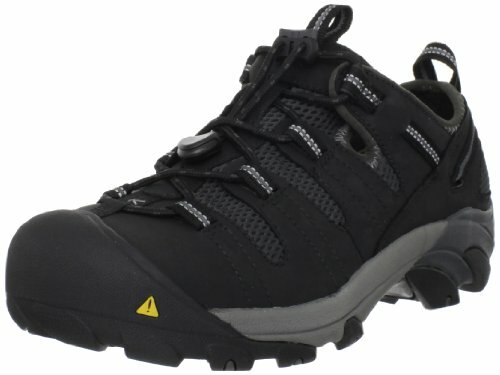 They have odor protection, arch support, and fit as snug as a hiking boot, cradling your heels and feet for comfort. Your work colleagues might think you’re wearing sneakers when they see these offerings from Skechers on your feet. Behind the stylish look hides alloy safety toes, slip-resistant soles, and memory foam cushioning. They are also rated for electrical hazards. 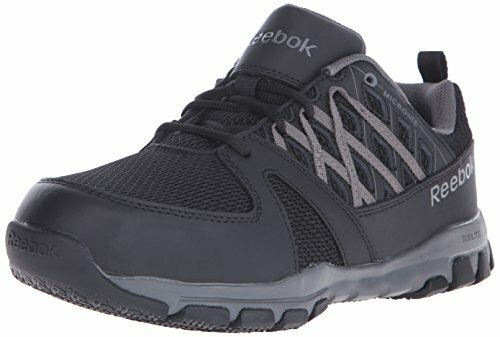 Reebok is another brand of athletic shoes which also provides models suitable for the workplace. These Sublite work shoes are designed to absorb shock, protect from electricity, prevent you from slipping, and also have steel toe caps. Additionally, they have an EVA midsole for comfort. 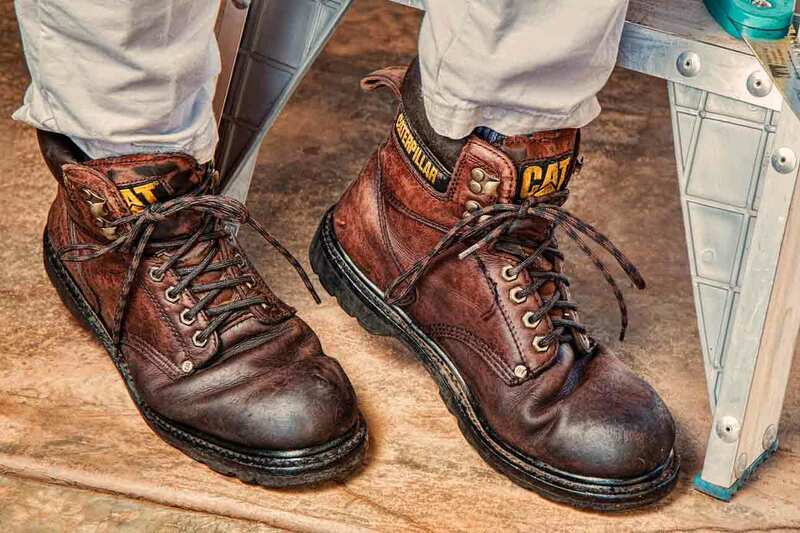 Caterpillar brings us a leather work boot with a padded collar and a speed lacing system. It has a steel toe cap and a steel shank in the sole, for stability and support. The polyurethane sock liner provides comfort and can be removed. This boot from Timberland has a leather upper and a welted rubber sole. It gives traction on slippery surfaces and has alloy safety toes. The midsole has polyurethane cushioning, and a nylon shank provides rigidity and support to the foot. 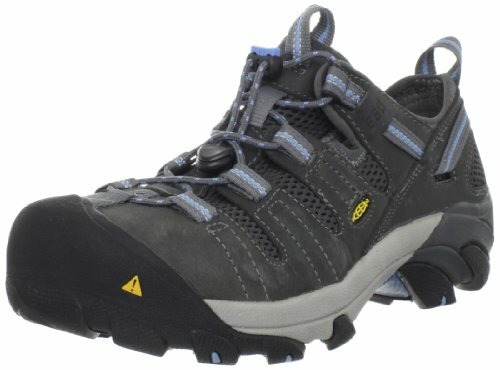 If you prefer more support at the ankle from a work shoe, this high top style from Keen is a good option. It has composite toes for protection, and a non-slip rubber outsole. This lightweight shoe has a PU midsole for comfort and is free from any metal in its construction. Working in a warehouse can be hazardous for your feet. Not only is there a risk of injury from falling objects, but it also means you’re on your feet a lot. Here are our top seven picks of the best shoes for warehouse work. This modern, stylish shoe from Timberland is packed with features. Available in three different colorways, it comes in sizes 7 through 15. Half sizes are available up to size 11.5 and you can choose from a medium or wide fit. The uppers are made from ripstop nylon and the nylon and plastic lace eyelets are hidden to prevent snagging. A lightweight alloy safety toe protects from falling objects. Anti-fatigue technology in the sole gives support and comfort, returning energy to your feet. There is also a polyurethane midsole which protects from electrical hazards, and a fiberglass shank for midfoot support. The outer sole is resistant to oil, abrasion, and heat, up to 248 degrees Fahrenheit. It’s made from hard wearing rubber and will help prevent slips and spills. The inner mesh lining has an antimicrobial treatment to keep your feet smelling fresh and feeling comfortable. Timberland offers a 30-day comfort guarantee. If, during the first 30 days,you feel they aren’t as comfortable as other brands of work shoes you’ve worn, the company will refund your money. Just make sure you keep your receipt. Non-slip, heat protective soles, rated for electrical hazards. Fabric over the toe cap can be susceptible to damage. These are lightweight safety shoes with a protective toe cap which is heat resistant and rated for electrical hazards. They help absorb shock and keep feet fresh with antimicrobial liners. These rugged looking sneaker-style work shoes have a water-resistant nubuck leather and mesh upper. They are available in three different colors and sizes, from 7 through 15, with half sizes up to a size 11.5. Fittings include medium and wide widths. The uppers, combined with a breathable mesh liner, keep feet warm in winter and cool in summer. The secure lace capture system prevents them from dangling and coming unfastened. There is also reflective webbing for added safety. Keen has patented its steel toe protection. The outer sole wraps up and over to protect your feet, and they are asymmetrical for each foot. The toe box is also roomy to provide comfort. The footbed itself has arch support and cradles the foot, and the heel is contoured to hold your foot in place. There is a shank for stability and a compressed EVA midsole for shock absorbency and comfort. The mesh lining repels water and there is a removable footbed. The rubber outer sole is non-marking and oil and slip resistant. There is also a version of this shoe available for women, in sizes 5 through 11, with a choice of wide and medium width fittings. Leather and mesh breathable uppers. The lacing system is an issue for some wearers. Keen brings us a steel toe-capped work shoe, with breathable leather and mesh uppers. The soles are anti-slip and the footbed has support for heels and arches. 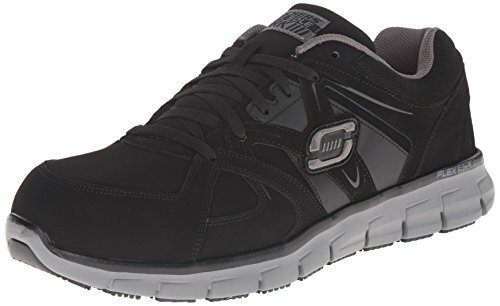 Skechers is another company that makes sporty-looking work shoes. This relaxed fit style comes in five different color combinations and sizes from 7 through 14, in medium and wide fittings. There are half size increments up to a size 11.5. The uppers are soft but durable nubuck leather with synthetic overlays and accents. They secure with laces and have padding at the tongue and collar. The safety toe is made with lightweight aluminum alloy. The rubber outer sole has traction and is slip resistant. The shoes are also protective against electrical hazards. Comfort is provided from a shock-absorbing flexible midsole, a soft fabric lining, and memory foam cushioned insoles. The relaxed fit is designed to give your feet room inside, to add to the comfort factor. Sole and upper might separate after a few months. This is a lightweight work shoe with an aluminum alloy protective toe cap. They have leather uppers and memory foam insoles. These casual looking shoes hide lots of protection. They are available in sizes 4 through 13 in medium and wide fittings, making them suitable for women as well. There are also half sizes up to a size 11.5. While these shoes are inspired by athletes, they are also lightweight and flexible work shoes. The uppers are leather with micro webbing and support your feet while letting them breathe. There is also a steel protective toe cap. A nylon mesh inner fabric helps wick moisture away from your feet and a removable cushioned footbed gives comfort. Laces help hold your foot in place in the shoe. The midsole is made from EVA and the footbed has Reebok’s FootFuel technology. This expands when you lift your foot and absorbs impact as you hit the floor. This provides bounceback as you walk for cushioning and comfort. The sole is made with Sublite foam technology and the slip-resistant tread helps keep you on your feet. There is no exposed metal on the uppers of the shoe, and the dual resistor design dissipates static. Athletic style shoe is lightweight and flexible. FootFuel technology helps prevent fatigue. Starting at a size 4 makes them suitable for women or men. Mesh top can be liable to wear. Athletic style steel toe-capped work shoe, with a leather and mesh upper for breathability. Support and cushioning from Reebok’s FootFuel technology helps prevent foot fatigue. Caterpillar is known for its machinery as well as work apparel. The company has applied its knowledge of machine tracks to the soles of these non-slip boots. 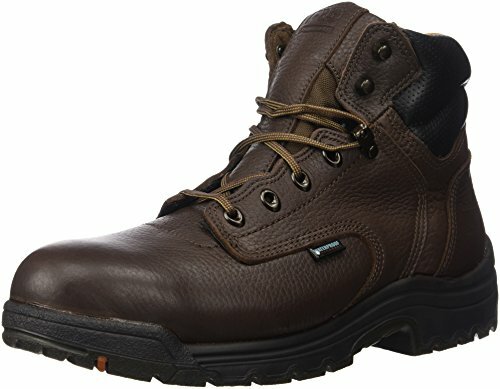 These are one of the best boots for warehouse work if you prefer more ankle support. The leather uppers are supportive and available in three shades of brown or black. Sizes range from a 7 through 14, with half sizes up to an 11.5. There are two width fittings: medium or wide. The shaft of the boot measures 6 inches and has a padded collar which hugs your ankles, giving stability and support. A mesh lining and a Climasphere insole work together with the leather uppers to let your feet breathe. There is a steel shank in the rubber sole for extra balance and a removable PU sock liner helps with comfort. These boots are also rated for open circuit electrical hazards up to 600 volts in dry conditions. Goodyear welt anti slip soles. Steel toe cap and electrical hazard rating. Might take a while to be broken in. The leather uppers, mesh lining, and Climasphere insoles allow feet to breathe. The soles are Goodyear welted anti-slip and they have an electrical hazard rating. 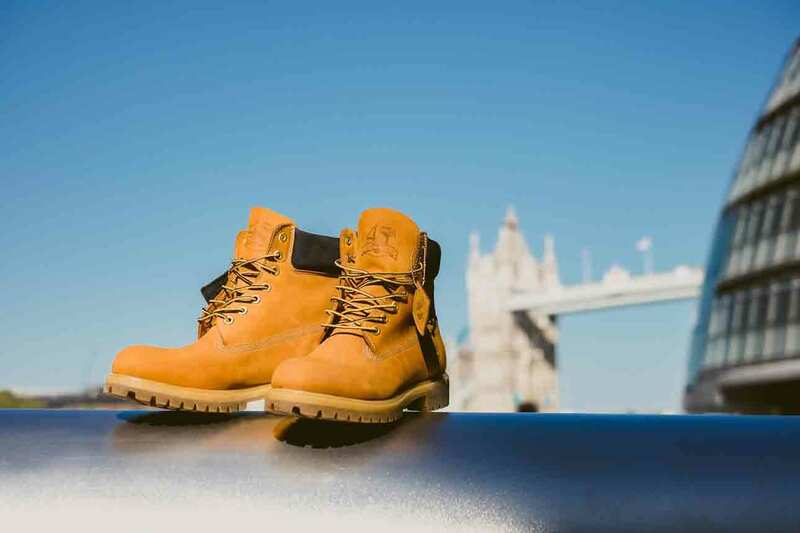 Timberland is well known for its hard working boots. For those of you that like the thought of something lightweight, but prefer boots to shoes, these could fit the bill. They are some of the best boots available for warehouse workers. The dark brown leather uppers have a shaft that is 6 inches high, with padding on the tongue and at the ankle. These boots are also waterproof. They are available in sizes from 7 through 15, with half size increases up to 11.5, and three width fittings. You can choose from medium, wide, and extra wide. There is a mesh liner which channels moisture away from the feet and also contains an antimicrobial treatment. This helps keep feet comfortable and dry. A polyurethane midsole gives cushioning which is both lightweight and durable. There is also a nylon shank to give rigidity and support. The protective toe cap is made from lightweight TiTAN® alloy. The outer sole is made from Timberland Pro rubber and offers resistance to heat, slipping, oil, and abrasion. These boots also offer protection for electrical hazards. Lightweight TiTAN® alloy protective toe cap. Protection from electricals, heat, and slipping. Waterproof leather uppers and moisture wicking inner lining. Covered by Timberland’s 30-day comfort guarantee. The laces could be longer and of better quality. This is a lightweight option if you prefer boots to shoes. They are comfortable and supportive, with protective toe caps. They are also slip resistant and water resistant. If you like the idea of a sneaker style shoe but want more support from a high-top style, this style from Keen could work. It’s available in sizes 7 through 15, in medium and wide fittings. There are half sizes between 7.5 and 11.5. The uppers are made from a waterproof nubuck and PU coated suede. They have a 6-inch shaft which is padded at the ankle, and a moisture wicking lining. KeenDry technology allows moisture to escape without letting water through. The protective toe is made from a composite material, keeping these shoes lightweight, and is covered with rubber from the extended sole. Odor control is provided from Keen’s Cleansport NXT. There is no metal used in these shoes. Comfort comes from the PU midsole and a removable EVA footbed. A TPU shank gives the shoe stability. The outer soles are designed to be non-slip and oil resistant. Lightweight composite rubber covered toe cap. 6-inch shaft for ankle support. Some find they need to change out the insoles for a more supportive one. This high-top style work shoe is lightweight with a composite protective toe. They are waterproof but breathable, with built-in odor control, keeping feet dry and fresh. What Are Safety Shoes and Why Do I Need Them? Workplaces like a warehouse might be full of hazards. The concrete floors can be hard on the feet but moreover, you might drop things on your toes. For this reason, safety shoes are really a must-have for warehouse workers. It might also be the case that your employer insists that you have appropriate protection for your feet. Occupational Health and Safety have rules around employers and workers in hazardous conditions. One of these is the need for safety shoes or boots. About 60,000 people in the US suffer foot injuries every year. Around 80 percent of these injuries are caused by items weighing 30 pounds or less dropping on the feet. 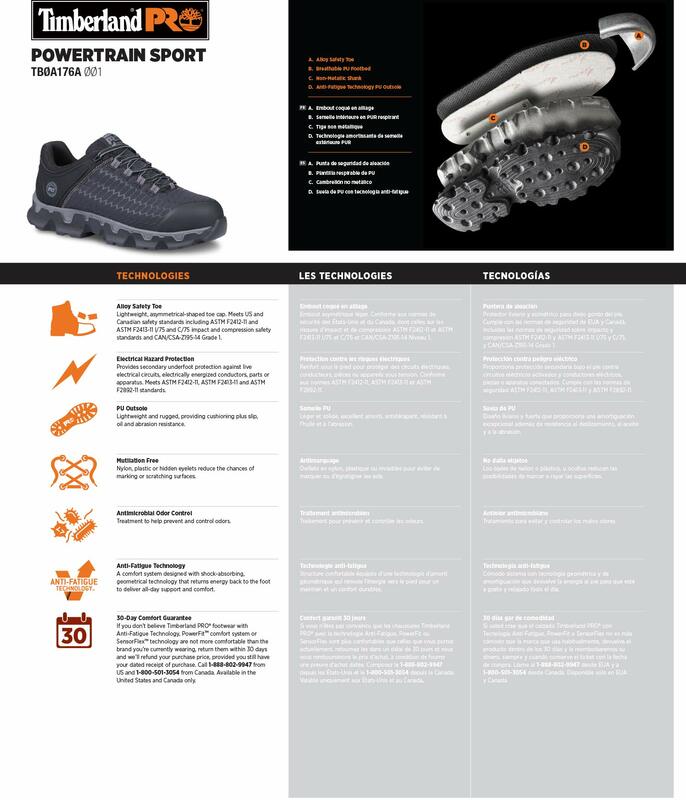 Safety shoes are designed with toe protection to help prevent wearers being injured by falling objects. They generally have support for the feet built in, so that wear and tear on your feet and joints is also minimized. Let’s take a look at what constitutes a good safety shoe. The toes are some of the most vulnerable parts of the feet. There are 26 bones in each foot and 14 of these are found in the toes. Protection for this delicate part of the body comes in the form of a safety toe cap. 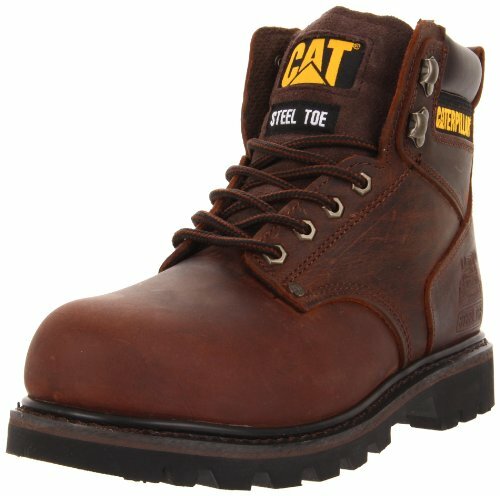 Steel toe caps: These toe caps have long been the choice of many protective shoes and boots, as they are strong and durable. They can be dented and bent by falling objects, but still offer protection. On the downside, they’re heavier than some of the alternatives, so might not be the best choice if you do a lot of walking. Alloy toe caps: These offer a similar protection to steel and are generally made of aluminum, titanium, and other metals. They do tend to be thicker than steel toe caps, but they’re usually about 30 to 50 percent lighter, making them a good choice for sneaker style shoes. Again, they can bend when impacted but will still protect those delicate bones. Composite toe caps: This lightweight design toe cap is made from materials like Kevlar, carbon fiber, fiberglass, or plastic. They contain no metal, making them a good choice if electrical hazards are present. Although they’re a better alternative if you don’t want added weight, they do tend to be bulkier in size. This video explains the difference between these three types of protective toe caps. One of the considerations when choosing the type of toe caps is comfort. Your toes should not hit the front of the toe caps and neither should they be so far back that the toe cap doesn’t protect them. You can check whether your toes are in the right place by squatting down in your shoes or boots. The base of your toes should sit just behind where they bend (the flex point). Insoles: Most safety shoes and boots are supplied with supportive insoles that will cushion your feet, keeping them comfortable. They might have extra support for your arches and heels. Some are removable and if you find they aren’t the right fit, they can be replaced. Midsole: The midsole of boots and soles are also often designed to help relieve fatigue and keep your feet comfortable all day long. These could be made from EVA or a company’s proprietary material. They help by cushioning the feet and providing bounceback when you walk. Padding: Having a shoe or boot that digs in at the heel or under the laces is no fun. Look for padding in the ankle or on the tongue, that will stop the shoes from digging in and causing discomfort. Fit: Making sure your boots fit you correctly is important to the comfort they will provide. Laces should hold your feet in the shoes or boots, without the heel slipping. There should also be wiggle room for your toes so they aren’t cramped. Moisture control: Hot, sweaty feet can lead to blisters and foot conditions, like athlete’s foot or fungal infections. Many shoes have breathable uppers and liners, which will wick moisture away from your feet and control odor. Non-slip: Look for an outer sole that has a good tread and which the manufacturer has rated as resistant against slipping. This way you won’t tumble over on a smooth cement or tiled floor. Electrical hazards: You may or may not come into contact with electrical hazards, but if you do, this an important feature to have. It will protect you from open circuits and keep you safe. These are usually shoes that have no metal in them, and with rubber soles. You will also want your work shoes or boots to last. They’re an investment, so buy the best quality you can afford at the time. This video gives you a guide to some things you should look out for when buying safety shoes or boots. 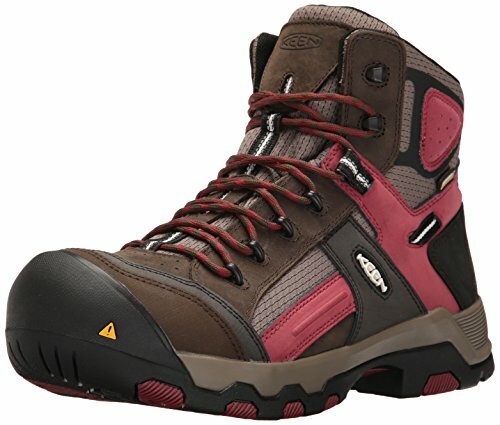 Which Are the Best Shoes for Working in a Warehouse with a Concrete Floor? Concrete is unforgiving on the feet, so you will want to make sure that there is plenty of cushioning in your footwear. You should also look for a durable sole and upper that won’t wear out. Are Safety Shoes a Requirement in a Warehouse? Working in a warehouse could leave you at risk from objects falling on your feet. There is also the possibility that there could be screws or nails on the floor which might penetrate the soles of your shoes. For these reasons, the chances are that safety footwear will be mandatory, but check with your employer. Are There Things to Avoid When Choosing Shoes for Warehouse Work? Yes there are. As silly as it may sound, you don’t want to be wearing heels. We aren’t talking about stilettos here, but blocky heels over about 2 inches will not be stable or comfortable. Then there is the fashion victim. Yes, it’s nice to have shoes that look cool, but if they don’t protect your feet, then you will be the one that suffers. Save the aesthetics for your leisure time and choose work shoes for their safety and comfort features. There is little doubt that as a warehouse picker there will be times when your feet are under pressure. Whether it’s from spending all day standing or walking around on hard floors or from the risk of something falling on them. It’s important that you choose a pair of shoes or boots that will meet the safety standards you need and also ones that are comfortable. Of our top seven picks of the best shoes for warehouse pickers, our favorite is the Timberland PRO Men’s Powertrain Sport Alloy-Toe. 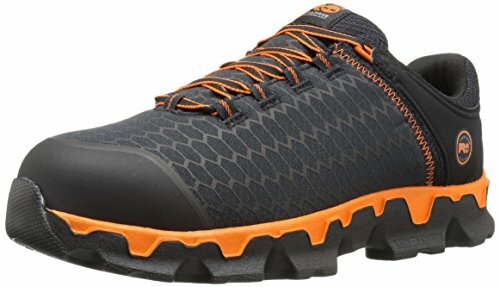 It’s lightweight but supportive and comfortable, and has alloy safety toe caps. The liners are treated to prevent odor, it’s non-slip, heat protective, and rated for electrical hazards. We hope you found our guide informative and useful. Please leave us a comment, we would love to hear from you, and don’t forget to share.